My colleague Jane Allison and I got to spend a morning with entrepreneurs participating in the 2018 Lion’s Lair competition organized by the Innovation Factory in Hamilton, Ontario. We offered up media relations advice to an amazing group of job creators, prosperity builders, problem solvers and change makers. Jane and I have been running free media relations workshops since 2007 as a way to thank non-profits, community groups and entrepreneurs who have inspiring stories to share. The Fit Active and Beautiful Foundation story pitch was published in the Hamilton Spectator June 21. The Innovation Factory story pitch was published June 27. The Wellwood story pitch was published June 28. The Mohawk Sustainability Office story pitch was published July 2. The Opening Hearts story pitch was published July 14. For the remainder of the afternoon, Mohawk journalism professor David Smillie, with an assist from journalism students Kristina Costabile and Josh Stewart, ran a hands-on workshop to help campers stand and deliver in front of a camera. Campers were then offered an optional tour of the newsroom and printing presses. In an evaluation completed by campers, 100 per cent agreed the camp was a good use of their time, they learned something new and they’d recommend the camp to colleagues. 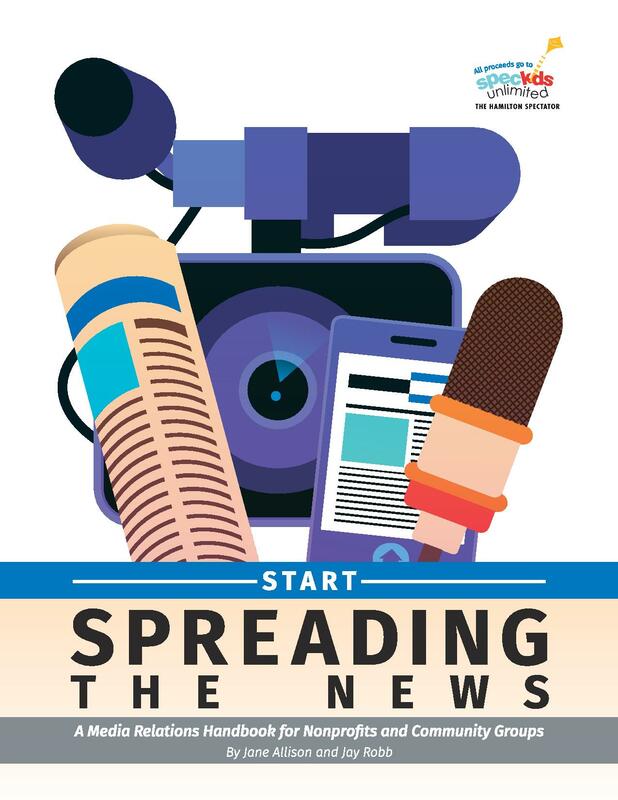 Each camper received a complimentary copy of Start Spreading the News: A Media Relations Handbook for Nonprofits and Community Groups and a contact list for Hamilton media. The first media camp story pitch was published in the Hamilton Spectator on June 21. More than 150 nonprofits and community groups have attended media relations summer camps since 2007 to learn how to pitch better stories and earn more media coverage. The camp won a 2015 Great Ideas Award from Newspapers Canada. For more information on the media relations summer camp, contact Jane Allison, manager of community partnerships at the Hamilton Spectator (jallison@thespec.com) or Jay Robb, director of communications at Mohawk College (jay.robb@mohawkcollege.ca). Volunteers, staff and board members with Hamilton nonprofits, community groups and associations are invited to the 7th annual media relations camp June 24 and 26 at The Hamilton Spectator. With help from local PR pros, campers will polish, practice and then pitch story ideas to a panel of Spectator editors and reporters. Some of the best pitches from past camps have wound up in the print and online versions of The Spectator. Campers will also get hands-on crash courses in how to give on-camera interviews, pen letters to the editor and op-eds and use social media to spread the news. The camp is free as a thank you to community builders who make Hamilton an even better place to call home. Register online by Friday, May 23. Highlights from the 2013 camp and evaluations from the 22 organizations that took part are posted here. What’s good about Hamilton and your neighbourhood? How do you know you are home? What attracted you to Hamilton and your neighbourhood? What would make you want to work or live here in Hamilton even longer? What skills and abilities can you contribute to make Hamilton and your neighbourhood better? Thanks to the 22 nonprofits and community groups from Greater Hamilton that took part in the 6th annual media relations summer camp at the Hamilton Spectator June 25 and 27. The camp is offered free of charge as a thank-you to community builders who are making Hamilton a better place to call home. The camp aims to help nonprofits and community groups tell better stories and get more coverage that advances their vision, mission and strategic priorities. The camp kicked off with a media relations primer, showing that nonprofits have better stories to pitch beyond grip and grin cheque presentations, groundbreakings, ribbon cuttings, fundraisers, annual general meetings and golf tournaments. Campers were encouraged to build a story pitch around a person with a compelling story, become resident experts for media in their field of expertise and look for opportunities to get coverage through newsjacking. Campers then broke into small groups and used worksheets to prepare story pitches. Six public relations and journalism pros volunteered their time as camp counselors to help campers polish and practice their pitches (tip of the hat to counselors Megan Bieksa, Trish Nelson, Grace Diffey, Carrie Trembinski, Kurt Muller and Reba Shahid). Hamilton Spectator managing editor Jim Poling and reporters Joanna Frketich and Molly Hayes did a noon-hour, working lunch Q&A session with the campers, offering advice on how to pitch stories and work with reporters and editors. The Q&A was followed by a social media primer by Stephanie Shuster, studio manager with KITESTRING. Campers then finished working on their story ideas, which were formatted as mock email pitches and turned into a handout. A smaller group of campers ended their day with a tour of the Spectator newsroom. Jane Allison, manager of community partnerships with the Hamilton Spectator, gave an overview of how the newspaper supports nonprofits and community groups. Editor Lee Prokaska gave campers a primer on how to write and submit letters to the editor and op-eds and how to request and what to expect during editorial boards. Over a working lunch, 11 campers read their story pitches to a review panel that featured managing editor Hoaward Elliott, city editor Carla Ammerata, editors Aviva Boxer and Cheryl Stepan columnist Susan Clairmont and reporter Emma Reilly. The panel highlighted what worked and what could be improved with each pitch. The camp closed with a workshop on how to give on-camera interviews and shoot videos by Mohawk College Journalism professors Kurt Muller and David Smillie and student Scott Summerhayes. The story pitched by the Hamilton Youth Steel Orchestra became the first from the camp to land in the pages of the Spectator, running as the GO Weekend cover story on June 29. Did you learn anything new at the media relations summer camp? Was the media relations camp a good use of your time? What did you value most about the camp? The advice from real professionals about how to pitch stories to the media. Pitching media releases to panel!! I also appreciated the counsellor advice on day one. I really valued learning about the process of pitching stories and the panel discussions about what worked and what was the catch. Ability to hone my pitch by being forced to think like a reporter. It is very logical and basic but because it is not implied, we should make that known. Useful to know what stories work / did not. The pitch concept and practice. Real people in the business being willing to share their expertise. I really felt that the fears and mistrust I had in the media has been replaced with an understanding of who the reporters are, what their challenges are and how I can best work with them. Having met real reporters, I see they are approachable. If you could improve one thing about the camp, what would it be? More on-the-spot practice – loved pitching to the editorial board, loved practicing on-camera. Please do not schedule pitches while food is sitting. Move pitches to earlier in the morning. Second morning had wasted time. It felt uncomfortable pitching while judges were looking at food. The room was freezing. Please turn down the air conditioner. Great camp. Thanks to all for presenting and organizing. Thank you for the opportunity. It is a valuable resource to the community, increasing accessibility and removing barriers between community and media. Thank you for taking the time and sharing your thoughts with us. Jay and Jane were awesome facilitators. Jay and Jane, you guys are awesome. Thanks so much. This was such a great opportunity. I learned a lot. I also enjoyed the tour of the newsroom. Jane and Jay were wonderful facilitators. Thank you. I hope this happens again. Thank you for the opportunity and for providing snacks and lunch. It was greatly appreciated. Valuable program. Well worth time off work.